As a State-owned Company (SOC), Transnet must deliver on national developmental goals, as they pertain to the transport and logistics sector, ensuring that the country remains competitive on the continent and globally. During the mid-2000’s global commodity ‘super cycle’, it became apparent that South Africa’s historical underinvestment in infrastructure inhibited the country from benefiting to the fullest from this upward swing in commodity markets, constraining our overall market competitiveness. 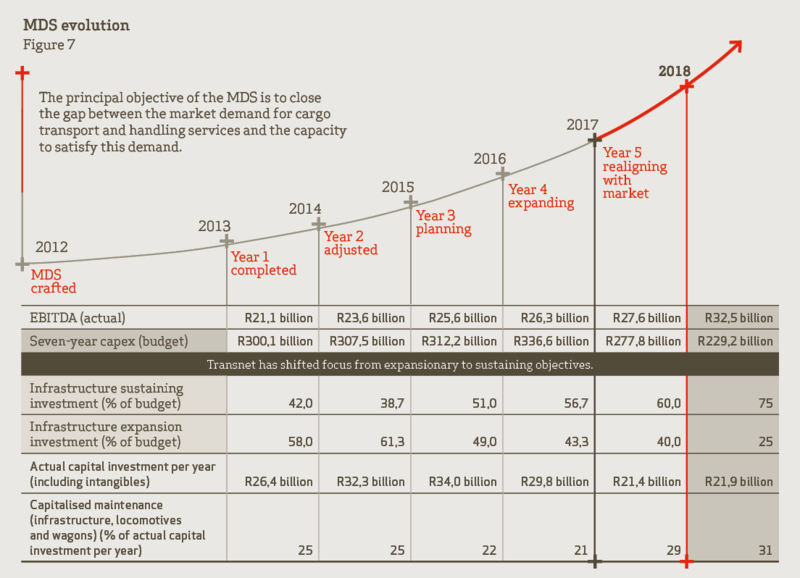 The Market Demand Strategy (MDS) was Transnet’s response to this challenge of infrastructure underinvestment, with the MDS poised to create the required long-term capacity ahead of demand by investing through short-term economic cycles. The MDS was always intended to cater for future demand, anticipating the required capacity we would need as a country and as a business to take advantage of future commodity booms, or even just catering adequately for future economic growth. Transnet also intended that the ramp-up in capacity should happen in the shortest possible window to address the country’s immediate-term capacity constraints. At the core of MDS was South Africa’s own aspirations: becoming a key thermal coal exporter, as well as an increasingly important fourth largest supplier of iron ore to China, a leading global manganese exporter, the leading logistics hub for sub-Saharan Africa, and a globally-recognised benchmark for container and heavy-haul operations. The majority share of investment was allocated to General Freight and Freight Rail, by increasing GFB rail capacity growth to meet market demand volumes from 79,7 mt to 170,2 mt, increasing Transnet’s fleet, improving infrastructure, and completing the New Multi-Product Pipeline. These initiatives intended to create additional capacity across all commodities. Anticipated growth in General Freight would be coupled with significant improvements in rail operational performance, as well as productivity improvements and improved asset utilisation at the ports. Throughout the seven-year cycle, Transnet continuously adapted to cash flow requirements (cash flow from operations versus capital investments) to ensure an affordable and realistic funding plan within approved financial parameters. The MDS’s key tenet of moving rail-friendly cargo from road to rail would not only lower the cost of doing business in South Africa, through reduced logistics costs, efficiency improvements and coastal transshipments, and moving containers on rail, but it would also have marked benefits for the environment by curbing carbon emissions, with emissions from road freight contributing up to ~96% of overall freight emissions1. However, it would be short-sighted to lock the MDS's guiding principles into a time-based seven-year strategic cycle, given that there was no guarantee that another global commodity boom would transpire during the seven-year MDS period from 2012 to 2019. While our investment aspirations to create capacity ahead of demand materialised during the seven-year period, the anticipated commodity growth and associated volumes did not. As a SOC it is irresponsible to continue to invest in national infrastructure when anticipated economic growth – both domestically and globally – does not materialise. This does not mean that it never will. However, the business must be agile enough to respond to 'what is', as much as 'what could be' – that is, take the current low growth path in the short term to remain financially stable, while preparing for possible future high-growth paths to remain economically sustainable. The MDS is, and potentially always was, a long-term planning blueprint from which to create future growth, rather than simply a medium-term counter-cyclical investment strategy. Transnet has all but closed the capacity gap in freight logistics infrastructure demand and is now poised to springboard its growth and diversification aspirations. Stated differently, whereas the MDS provides us with the organisational philosophy to invest for future capacitation of the business, Transnet 4.0 – our strategic prelude into the 4th Industrial Revolution – identifies what type of business we need to become to take advantage of future growth. It enables us to look beyond 'business as usual' to identify what type of trains, ports and operations we need to build, and which markets we need to enter to drive South Africa's – and indeed Africa's – global competitiveness in the new 4.0 digital paradigm. Transnet 4.0 is launching off the firm bedrock created by the MDS and requires a fundamental reimagining of the organisation, its operations and culture. We easily reach for terms such as 'innovative' and 'disruptive' when we describe our impressions of the '4.0' organisation. However, the 4th Industrial Revolution includes the simple and the mundane. Ultimately, we must do what it takes to do more for our customers than anyone else will. Transnet 4.0 is well encapsulated by the mission statement: 'Solutions delivered'. R165,6 billion in capital investment over the past six years, averaging R28,8 billion per year. The period was also tainted by a credit ratings downgrade of Transnet’s foreign and local currency ratings, both due to the rating action on the sovereign, as Transnet is viewed to be closely linked to the Government. The downgrades precipitated increased financing costs and a forced slowdown in capital expenditure, aligned to validated demand, necessitating a need to supplement investments with capital raised through private sector partnerships. Albeit Transnet’s financial position, liquidity and solvency have not suffered significant negative impacts, the downgrade – coupled with slow recovery in the macroeconomic environment – has made the transition to Transnet 4.0 increasingly urgent. Transnet has seen volatile commodity prices severely impact freight volumes and revenue in recent years. Despite demonstrating resilience to commodity market volatility, we recognise the need to pursue alternative opportunities to ensure financial sustainability. 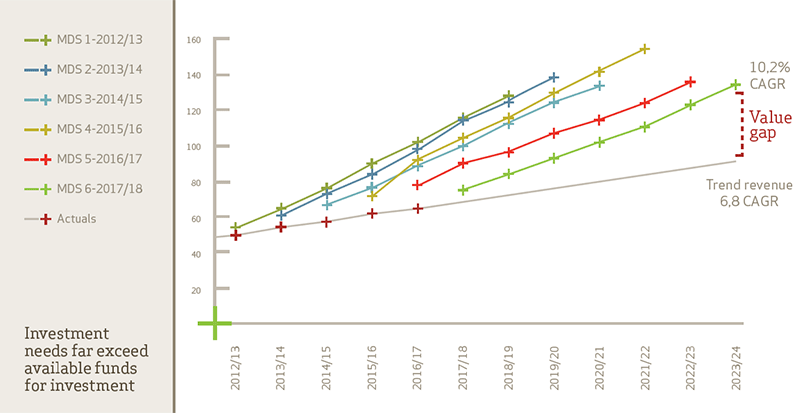 Indeed, revenue growth and profits have been erratic for many transport and logistics companies over the last 10 years, with revenue increasing but profits not matching up to the rate of revenue increases on average. Return on capital employed (ROCE) and profits are relatively low for many companies in this sector when compared to other sectors, such as technology, consumer non-durables and retail. In future, Transnet’s own growth will depend on our ability to diversify value-added services, and to tap into some of the megatrends shaping the global transport and logistics sector. This implies diversifying revenue streams to tap into the logistics opportunities presented by rapidly developing economies. These opportunities relate, for instance, to logistics advisory services, infrastructure development and freight forwarding over large distances. Consolidation of the logistics sector, where larger players acquire small or niche players, is a growing trend in the transport and logistics sector, in part due to companies’ reduced payloads, low profitability levels and evolving customer preferences. Other notable reasons include geographic expansion, securing management talent and broadening service offerings. Innovative, ‘uber-like’ last mile solutions are already part of the logistics product and service environment. In 2013, DHL Freight in Sweden piloted a mobile app called ‘My Ways’ to connect shippers with individuals willing to deliver packages along their daily routes in return for a small fee.1 Furthermore, a shake-up of the container market could be imminent through the potential ‘uberisation’ of this sector. The use of mobile technology to connect truck drivers to loads has been shown to reduce congestion and reduce distances travelled without cargo on return trips. These advances will result in lower operating costs for trucking. For Transnet, this may present an opportunity for new revenue streams through the implementation of a new business line, built on offering ‘asset-light’ products and services, such as volume aggregators using third-party assets for shipments. In addition to having major economic and technological ramifications, the emerging 4th Industrial Revolution promises a systemic transformation of civil society, production, governance structures and human identity. This new digital paradigm will be characterised by a fusion of technologies poised to disrupt almost all industries. Transportation and communication costs are likely to reduce, and logistics and global supply chains will become more effective, with the cost of trade diminishing at a rapid rate, all of which will drive new markets and economic growth. 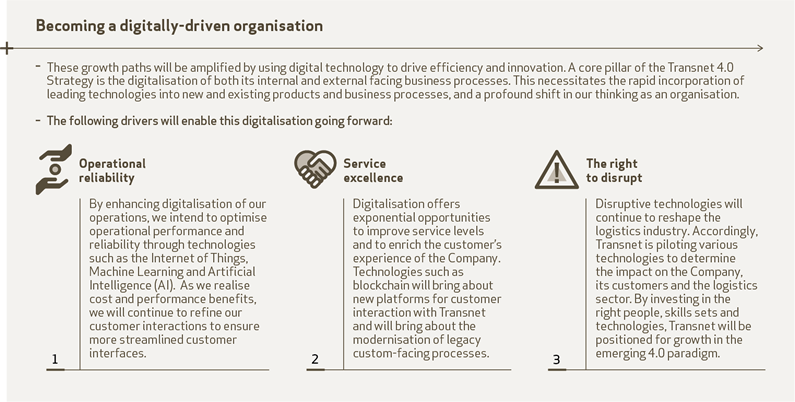 From a commercial perspective, the customer will be at the centre of all that is conceived, designed and executed, and will inform all efforts, enabled by an ever-expanding landscape of digital technologies and applications. Lowering operating costs through digital enablement, project prioritisation and strategic resourcing. We have set ourselves the ambitious goal of transitioning from our current second-party logistics provider (2PL) status to becoming a third-party logistics provider (3PL) in the short to medium term, and will ultimately strive for fourth-party logistics provider (4PL) status in the long term. The 3PL model will offer end-to-end logistics solutions to customers and, while we will continue to intensify our road-to-rail strategy to move more road freight to rail, our 3PL service offering will extend to addressing rail freighting constraints by negotiating alternative modes of transport on behalf of our key customers. 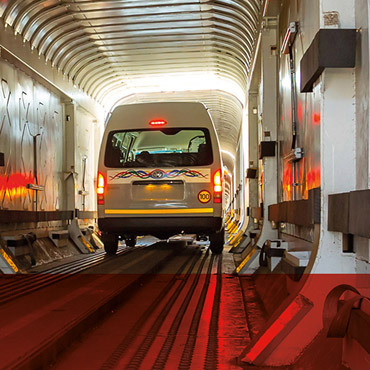 In adapting to the 4.0 industry changes in the logistics sector, Transnet is also exploring future opportunities to acquire small and niche operators in the logistics industry. Through Transnet 4.0 we are reimagining Transnet’s regional and indeed global identity. Transnet will drive all international-bound commercial activities through its newly formed subsidiary company, TIH. TIH which has been formally incorporated in the Department of Trade and Industry’s Companies and Intellectual Property Commission. An inaugural Shareholder meeting to appoint the Board was held on 27 February 2018, with the first Board meeting held on 15 March 2018. 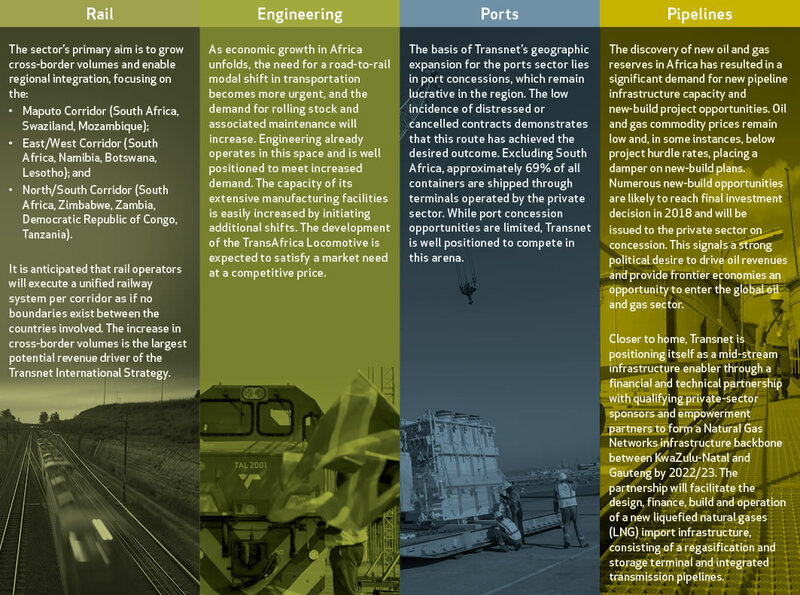 Transnet envisages multiple rail, port and pipeline projects on the continent, facilitated through TIH. Specific strategies are developed around areas of interest. The regional freight system benefits from deeper integration and enhanced connectivity. Transnet continues to participate in the New Partnership for Africa’s Development (Nepad) Business Foundation, Southern African Railways Association, Port Management Association of Eastern and Southern Africa and other regional forums. 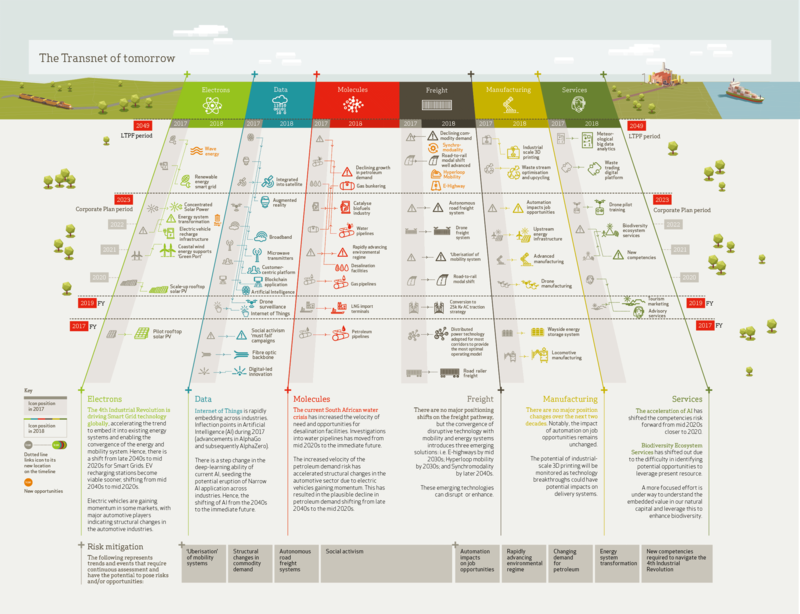 Our point of departure draws from our view of long-term sustainability. As a SOC, we cannot defer on our developmental mandate. Hence, our sustainable developmental outcomes form part of the essential blueprint for our new strategic direction. This means we need to consider our local suppliers in our expansion aspirations, acknowledge the new ways in which many ‘new economy’ enterprises and youth entrepreneurs work so they can benefit from our enterprise development programmes, involve our communities in our move to ‘digitalisation’, and consider developing the technologies and skills we will need 30 years from now. The skills, experience and investment support that private sector partnerships will bring to our geographic expansion strategy will also be invaluable, particularly as this support relates to port concession opportunities in the region, with approximately 69% of all containers shipped outside of South Africa being routed through terminals operated by the private sector. We also need to consider Transnet’s relationship with resources and energy. A key force for innovation in Transnet 4.0 will be to explore new revenue opportunities in the energy sector and intensify our commitment to the modal shift of freight from road to rail.